JOLED announced that it will co-develop high-end gaming monitors together with the Japanese "Burning Core" professional e-sport team. 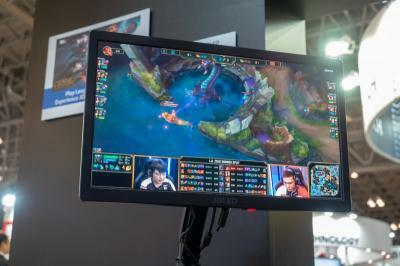 JOLED will develop the OLED monitors and Burning Core players will test the monitors and provide professional opinion so that JOLED can calibrate and perfect the image quality especially for gaming. JOLED started commercial production of its 21.6" 4K OLED panels in December 2017 - at its low volume production pilot 4.5-Gen line. JOLED's mass production line will be established in Nomi City, Ishikawa Prefecture, with a capacity of 20,000 monthly 5.5-Gen (1300x1500 mm) substrates. 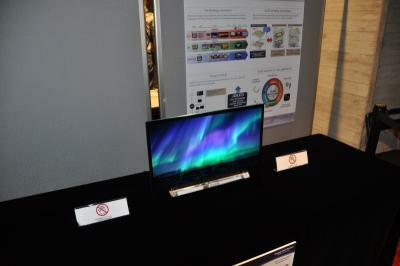 JOLED focuses on 10- to 32- inch displays for automotive displays, high-end monitors and more. This is fantastic to hear -- I hope it's low-persistence (rolling scan), zero-lag, and high-Hz. According to this https://www.oled-info.com/here-are-joleds-new-oled-display-prototypes their gaming panel is 21.6" 1920x1080. I wasn't expecting 1080p OLED but this is interesting, I would expect 240hz now? And here's JOLED's 21.6" 1920x1080 gaming "eSports" monitor developed with Burning Core. I am really curious if it has a low persistence mode! Will JOLED be similar to CRT technology at 50/60 Hz of refresh rate for flicke effect? nuninho1980 wrote: Will JOLED be similar to CRT technology at 50/60 Hz of refresh rate for flicker effect? Probably not at 60Hz. Only in impulsed mode. My anticipation is OLED will remain a purely sample-and-hold (flickerless) except for an optional ON/OFF blur reduction (impulsed / rolling scan) at 120Hz+ for future gaming monitors. I do encourage manufacturers to include this mode for 60Hz, and let users decide between flicker (low blur) versus sample-and-hold (more blur but flickerless). Can we speculate how much an OLED 22'' 1980x1080p 120hz could cost? What would be an acceptable minimum price? MatrixQW wrote: Can we speculate how much an OLED 22'' 1980x1080p 120hz could cost? I want this monitor badly. I still have a CRT that does 100hz at certain resolutions and the moving objects are clearer than any 240hz TN! Being the first 144hz oled panel I think it will be really expensive. But I have no idea how much. Certainly double price of other 144hz tn 1080p monitors! Notty_PT wrote: I want this monitor badly. I still have a CRT that does 100hz at certain resolutions and the moving objects are clearer than any 240hz TN! Unless you have a variable-persistence strobed TN that stays bright at 0.25ms MPRT. 5. Adjust strobe width (either ULMB Pulse Width or BenQ Strobe Duty) downwards to one-quarter original setting. 6. Now I can perfectly read the street names on TestUFO Panning Map Test at 3000 to 4000 pixels/sec on my TN! You cannot do that with normal ULMB / ELMB / DyAc at default settings. And it beats CRT in motion clarity. Well. Some of them. At least the Sony FW900 CRT. Try that panning map readability test on a Sony FW900 CRT (medium-persistence phoshpor), it begins to fail at slower motionspeeds than the best variable-persistence strobe-backlight TNs. Adjustable persistence dates back to the LightBoost 10% trick days. The strobe width follows Blur Busters Law darn near exactly (1ms strobewidth = 1ms of motion blur per 1000 pixels/sec). Which means 0.25ms flash only generates 1 pixel of motion blurring at 4000 pixels/second motion. Upcoming Lenovo Legion Y27gq (27" TN 0.5ms 1440p) will cost $999... I guess OLED 22'' 1980x1080p 120hz could cost 1-1.5k or more if will come from gaming brands.